Twitter has been grouching this week about journalists saying their life is better now they’ve moved out of London. Being grumpy about people leaving London fits the stereotype of Londoners rather well – particularly when they secretly want to leave too. But do Londoners actually want to quit the capital? Helpfully, Opinium asked something like this in their “Britain Uncovered” poll for the Guardian earlier this year. 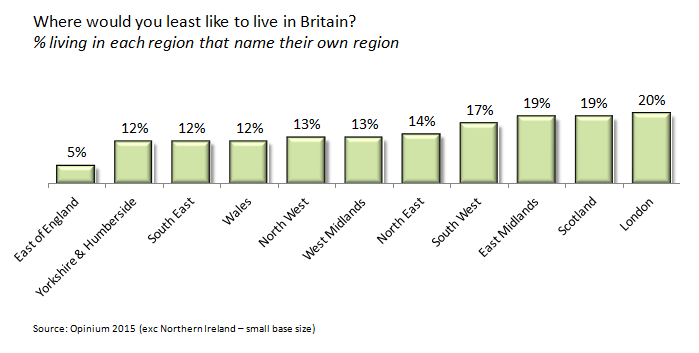 And yes, Londoners are indeed the most likely to say they’d least like to live in the place they currently do. Just. 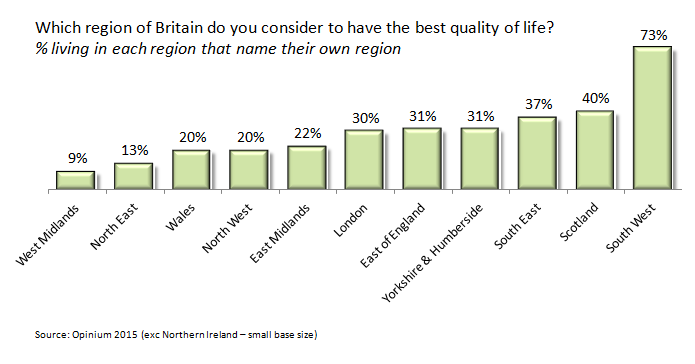 My other favourite stereotype-reinforcing finding from the poll is from the question on quality of life. People in the South-West really do think they have it better than everyone else (by miles). Boring words of warning: the poll wasn’t weighted at the regional level so it’s not a representative sample. And the sample sizes aren’t that big: dipping to 41 for the region with the fewest respondents (Wales). So you really can’t conclude from the poll that Londoners most want to leave. 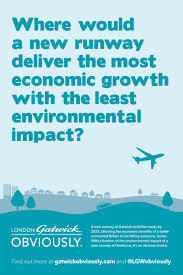 It’s well within the margin of error, and the weighting adds further uncertainty. The second chart probably stands up, though. Still, as long as we don’t look too closely, it seems that Londoners really do hate London and South Westerners are indeed smug living the good life. Maybe. 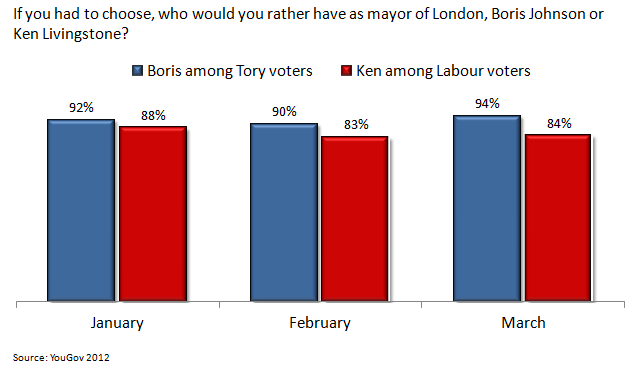 Since we’ve now had three polls on the London mayoral election since mid-January, now seems a good time to look at what they tell us about the race. When the last poll came out, Ken’s lead seemed a real surprise. In retrospect, perhaps it shouldn’t have done. Despite the shocked reaction, previous polls had suggested the race would be close: Ken’s January lead didn’t represent a sharp reversal in opinion, but actually a restatement of what we’d seen before. 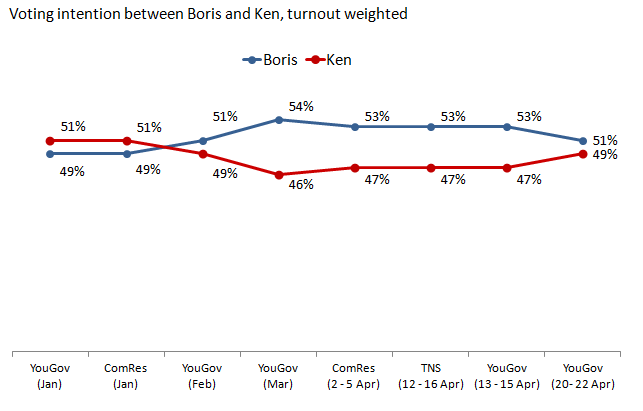 In terms of where these numbers might go, I would echo my previous suggestion that Boris could be boosted by an incumbency effect, but Ken might expect Labour’s overall showing to increase a couple of points in the next few months if, as seems likely, the Tories gradually lose the boosts they had from the EU walk-out and Miliband’s bad January (bad in terms of immediate poll reactions). 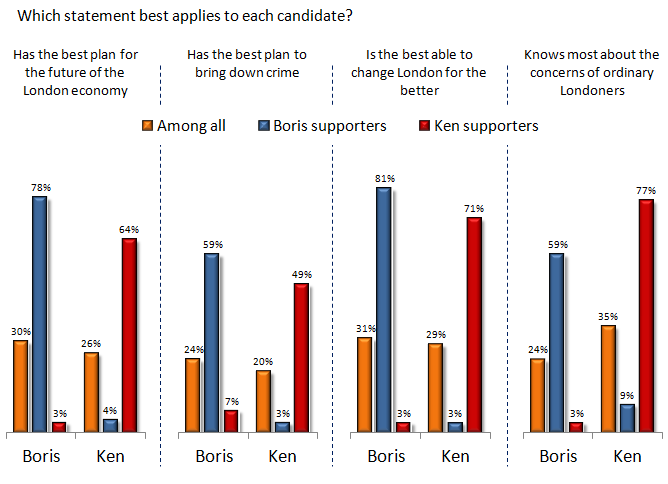 There also continues to be a ‘Labour for Boris’ vote as well as a ‘Tories for Ken’ crowd, as pointed out by Mark Gettleson at Politics Home. But the ComRes poll in particular demonstrates an interesting point about where the polls might go from here. 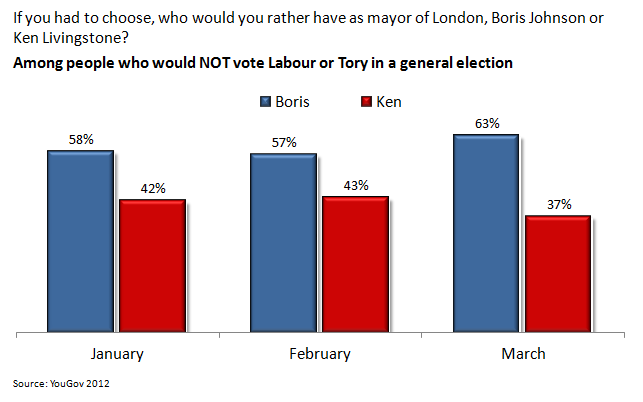 YouGov today have a poll that has radically changed expectations for this May’s London mayoral election. 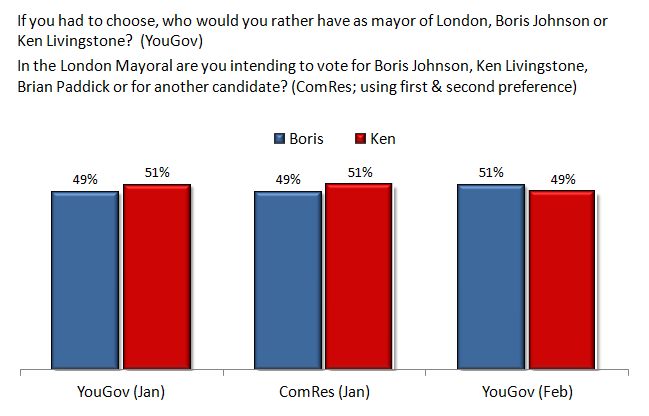 Previous polls had suggested that Boris Johnson was on course for a comfortable re-election, but today’s poll has put Ken Livingstone narrowly ahead, give or take a margin of error. Since polls on the vote have been relatively sparse, we can’t easily tell whether this is an outlier. But when looking at where Ken has got his boost, the results make intuitive sense. 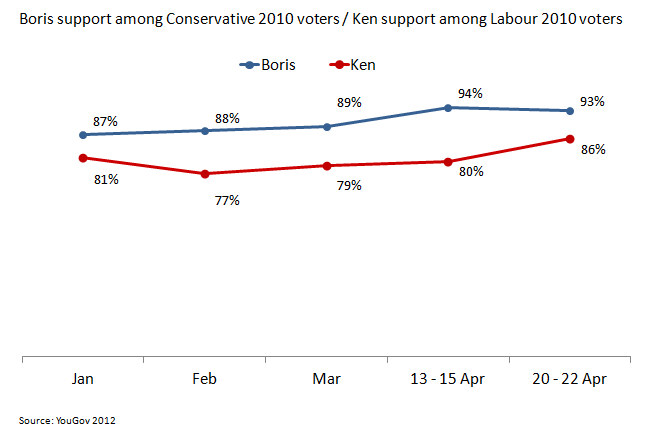 Quite simply, Labour voters have shifted strongly into the Ken camp, as the charts below show. 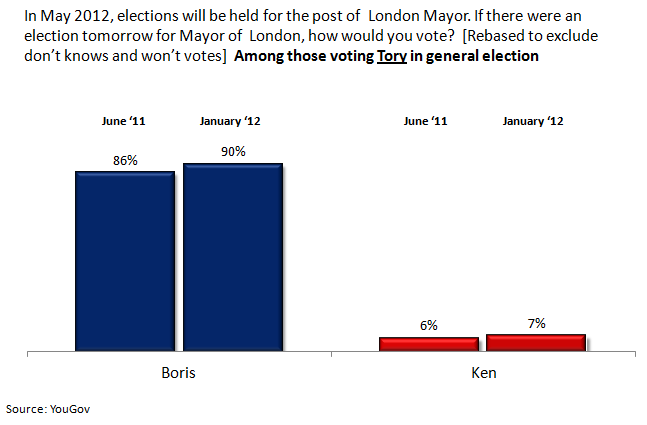 The first shows how Tory supporters would vote in the London election, comparing last June with today’s poll. 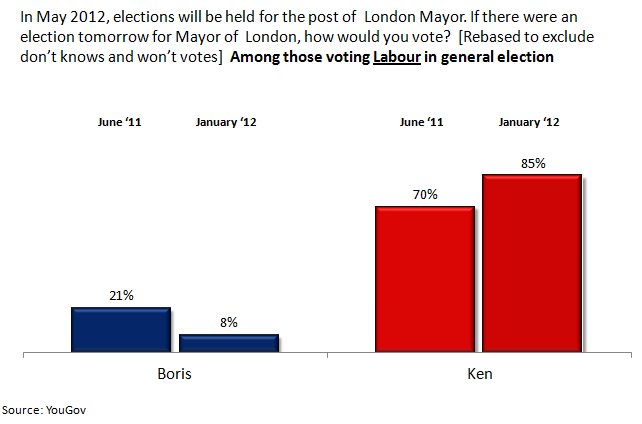 There has been very little change, with Boris taking pretty much all their votes.